"In 1974 the little known Swedish pop group Abba swept to superstardom with their Eurovision winning Waterloo, and four decades later the song and the band remain as popular as ever. 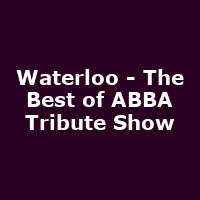 Now the phenominal new tribute show 'Waterloo' looks back at the sensational rise to stardom of Agnetha, Bjorn, Benny and Anni-Frid and gives fans the opportunity to experience the thrill of a live Abba show! The unique Abba sound is replicated with an incredible attention to detail by a full live cast and band - with stunning costumes and breathtaking choreography. The wonderful lyrics penned by Benny and Bjorn are sung in wonderful, captivating harmony from the opening refrain to the final sing-along chorus of this two-hour spectacular."